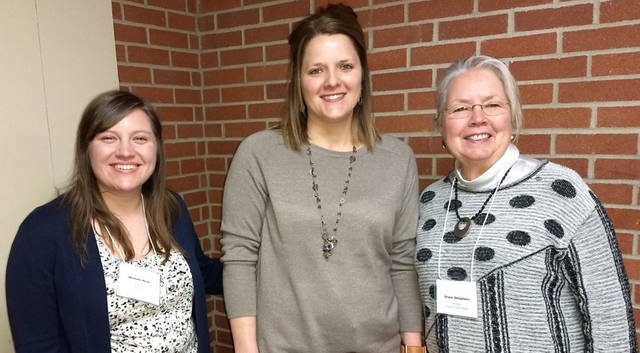 Pictured (l-r) at the Greenville Business & Professional Women’s Club meeting on Jan. 10 are Michelle Hook, Young Careerist Loure Bohn and Diane Delaplane. GREENVILLE – Young Careerist finalist Loure Bohn was the featured speaker at the Greenville Business & Professional Women’s Club meeting on Jan. 10. The meeting was hosted by the Young Careerist Committee consisting of chair Michelle Hook and members Brenda Miller, Diane Delaplane, Jessica Hester and Tammy Dietrich and held at the Brethren Retirement Community. Committee Chair Michelle Hook introduced Bohn, who is owner of Suds in a Bucket and offers cleaning services in Darke and Wayne counties. Bohn spoke on the difficulties women have in their transition after military life and how BPW can help. BPW can offer a safe place and friendships to help cope with the transition. Networking is an important part of BPW and can help with contacts for possible employment. Bohn suggested BPW could send notes of support to those women in the military who are overseas. Military veteran women offer leadership, time management, organization skills and would be great assets to BPW. Bohn is the Ohio BPW Region 5 winner and will compete at the state level competition scheduled for April 20 in Columbus. After the required speech and critique, Bohn spoke of her life’s journey to becoming an entrepreneur and starting her own cleaning business Suds in a Bucket. She found communication is the foundation of her business. Being trustworthy and paying attention to detail has brought her success. Bohn and Suds in a Bucket donated a prize of a three-hour cleaning service to support the BPW’s annual Super Raffle drawing held in December 2018. Those interested in learning more about the club can contact Membership Chair Sonya Crist at 937-423-3657 or sonyacrist@gmail.com.